Indians have created a big demand for scooters not only as a time saving measure but also for a comfortable two-wheeled travel; yet better than walking. Scooter are often used by people for office use, drive-by and time saving purposes. But most of the population fail to understand its worth after or before buying. And they do a big mistake with this big investment! Is scooter that what you really need! If you are a busy person and want to have a scooter for personal and fast use, you are going right. If you are living as couple (married) and have a particular route and location of your jobs or so on, you are again going right way. But sorry, if you gaze at buying a scooter for commercial use i.e. making such use of scooter as what is done with a beast of burden, you are going wrong and I suggest you to avoid buying a scooter for such purpose. And instead try buying something else that suits your passion like load carrier, tempo etc. Is your height and weight amazing! By amazing I mean too or excessive. Look, if you are too tall then leave the thoughts of buying a scooter as a style for you or for showoff. A person with height less that 5' 5" is ought to buy a scooter of length 42 inches which is perhaps stylish and average size of normal scooters but persons with height more than 5' 5" must choose a longer model of scooters for ride and convenience which indirectly reflect abnormality. But I personally tell you that height and length of scooter doesn't matter if you are a simple person with no-showoff intention. Now, if you are too weighty then I may again say, leave the thoughts of buying scooter. You will face many problems if you avoided yourself (being too heavy), while buying a scooter. Keep these two aspects in mind before going to a dealer for buying a scooter. Specifications and analysis at last! The last thing that I thought I should remind you about is the specification aspect. This aspect is must to be considered in the sense of mechanism. Always, before choosing a scooter check its specifications (in simple language, features). Consider comparing two or more scooters on the basis of headlight size, displacement, transmission, classy type, max power, max torque, engine type, front suspension, rear suspension, cooling type, front brakes, rear brakes, mileage, fuel capacity, wheelbase, wheel type, ignition, battery, headlamp, weight, length, width, height, ground clearance, seat length, top speed, and on last compare their warranty periods. 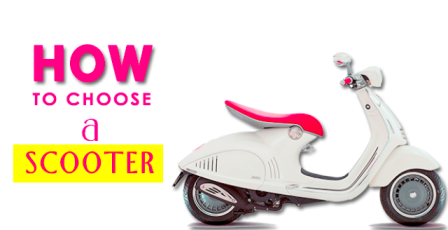 The best scooter on the basis of spec comparison will be your best choice then! Compare the latest scooter available in India now. About warranty: Warranty period of a scooter depends upon the dealers and manufacturers but singly warranty depends on newness. Yes! if you are buying a new/fresh scooter from a dealer you get it with a warranty period in which if anything happens wrong with your scooter except accidental damage of any thing terrible, dealer will be responsible to recover your scooter cost free or on discount rates. But if you are looking for warranty for your newly bought second hand scooter, it is impossible! keep this thing also in mind. Now you know the better aspects for choosing a scooter. So if you are buying a scooter, keep the above aspects in your mind and see the difference. If you want more information or have any doubt regarding the above, let me know from you. Nothing useful in this article. I am not able to decide anything on how to choose the best scooter for me and family. Can you please provide a scooter buying guide? Thank you for your honest feedback. My apologies if the said part of the article hurts anyone. It wasn't intentional. I have removed it now. If you have any other comments, please feel free to write to us.